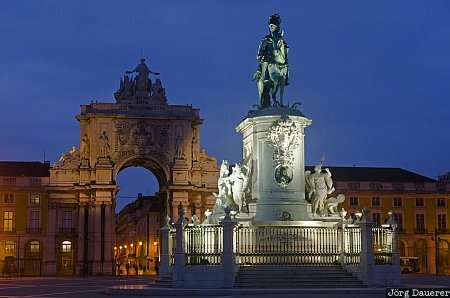 The Statue of King José I and the Arco Monumental in the background at Praca do Comercio at the banks of the river Tejo. Lisbon (Lisboa) is the capital of Portugal. This photo was taken in the morning of a cloudy day in April of 2011. This photo was taken with a digital camera.